Real time asset tracking software. Track goods, items, and assets from anywhere. Edgefinity IoT is real time asset tracking software. It is a complete RFID control software solutions perfect for manufacturers, or any operation looking to get a better handle on their supply chain and inventory. Implement an advanced RFID asset tracking system without any programming. Hardware and software installation takes weeks, not months to successfully install. 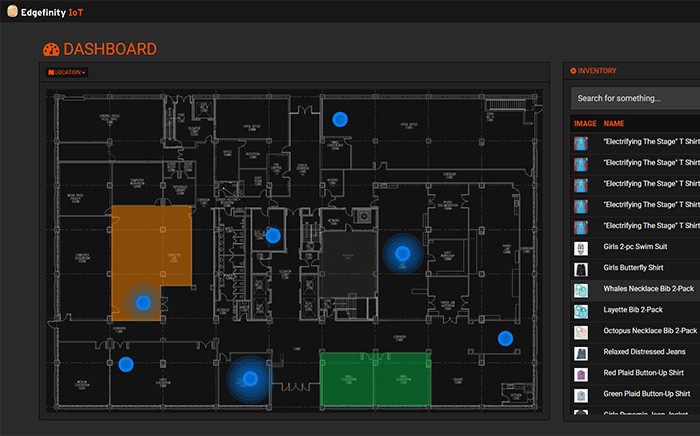 With Edgefinity IoT, you can achieve complete visualization of your facilities and inventory environments. Add floor maps of the facilities where your inventory is, so you can track your goods in real time. You can add as many facilities or floors as necessary. Edgefinity IoT can render any file type, and can automatically scale your maps with pinpoint accuracy. Once your maps are uploaded into Edgefinity IoT, users can display the locations in real time from any device. 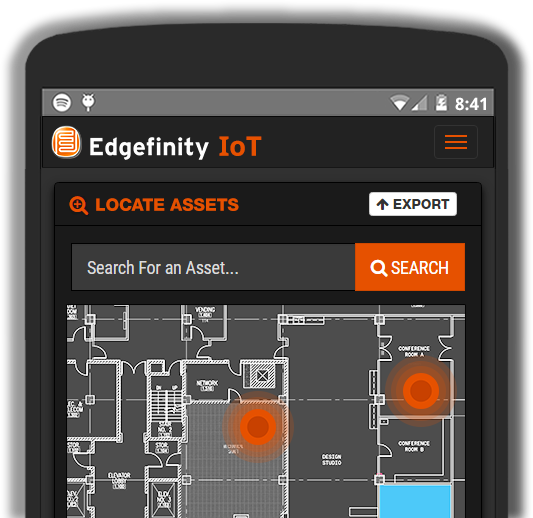 Within Edgefinity IoT, you can add all the assets, goods and devices you want to track. No computer programming is required. Once loaded into Edgefinity, you can track and search for items, and find their exact locations on your facility’s maps. Any item that is tagged with RFID can be tracked in real time by Edgefinity IoT. You can use Edgefinity’s convenient search function to browse locations, or asset groups. At the heart of Edgefinity IoT is the technologically advanced IoT rules engine. 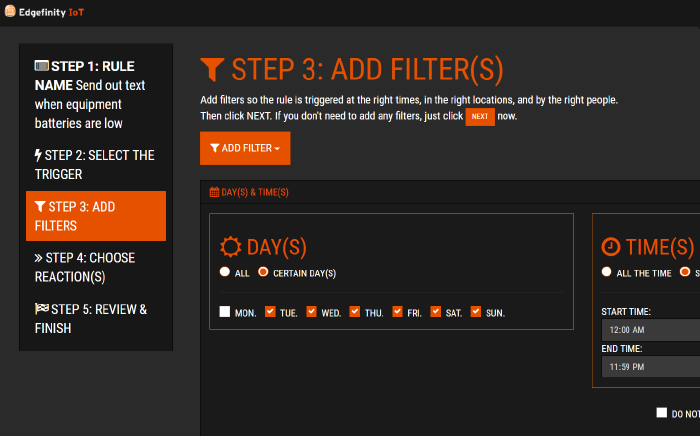 Developed highly customized rules so when certain things happen at specific places and times, you can create an exact set of reactions. 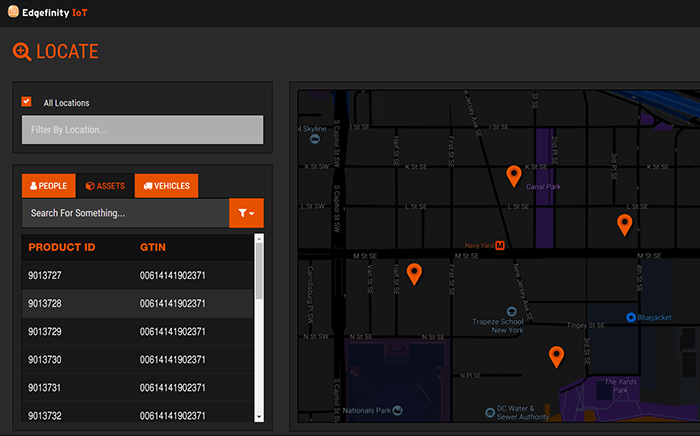 Edgefinity IoT lets you create complex rules to develop a highly customized real time tracking system. With no programming at all, end users can can create logical rules that can maintain when items get checked in/out, where items go, who uses equipment, and their current status. With Edgefinity IoT, you can get a live look at your entire facility. But, you can even go so granular that you can find the location of one single item – in real time. Edgefinity IoT is a new kind of RTLS built to help organizations streamline complicated processes. Receive immediate alerts if items are missing or mishandled based on rules you created. Edgefinity IoT gives you complete control over your facilities no matter your location. To help brand owners understand the intricacies of EPC mandates, RFID implementation, and, most importantly, how to benefit from tagging inventory, we decided to publish this guide. To help brand owners understand the intricacies of EPC mandates, RFID implementation, and, most importantly, how to benefit from a mandate, we decided to publish this guide. What Can CYBRA’s Real Time Asset Tracking Software Do For You? Edgefinity IoT is a complete RFID/RTLS solution perfect for manufacturers, or any operation looking to get a better handle on their supply chain and inventory. Implement an advanced inventory management system without any programming. 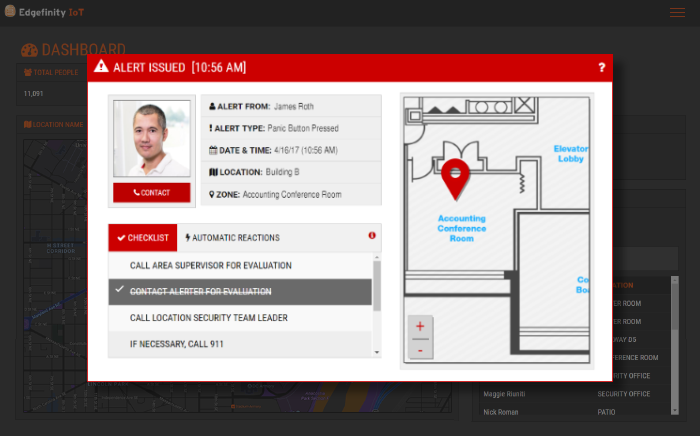 From your laptop or phone, you can find the exact location of any item within your facility. You can easily set up alerts any kind of incident or situation such as incorrect shipments, or missing equipment. Edgefinity IoT allows you to create complex rules that fit your real time tracking needs. INTERESTED IN REAL TIME ASSET TRACKING? Real time asset tracking software. Built on CYBRA’s expert RFID system technology, Edgefinity IoT baseline alerts were developed utilizing the latest in RFID and RTLS (Real Time Tracking Systems) capabilities. Contact an RFID expert today to see how our technology can improve your organizational operations. CYBRA’s RFID and RTLS technology combine to offer manufacturers and distributors the ability to track and locate assets in real time. Contact us to see how our applications can streamline your daily operations.